As Exeter chugs along in the background, I have any number of foreground pieces commanding my attention. 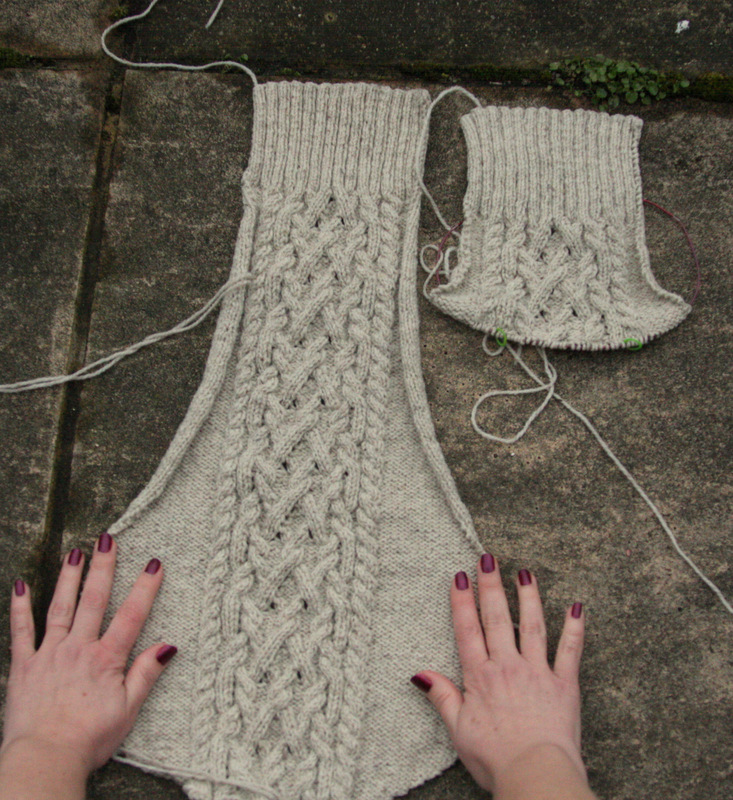 First, there was the Arleen T-shirt which I finished and blogged about last weekend. 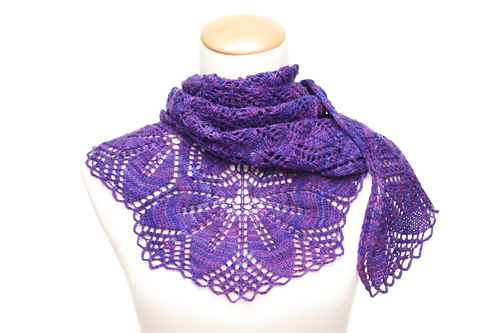 Then, I decided to cast on a Haruni shawl. 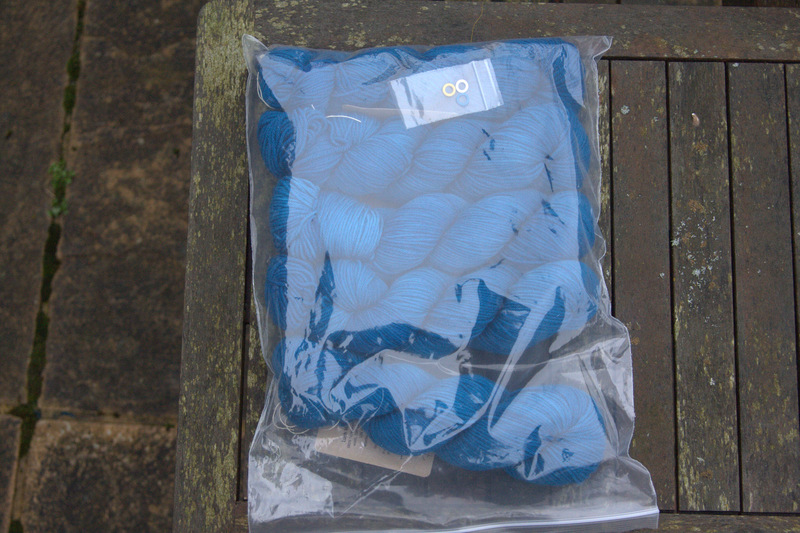 I bought the wool for this shawl, a skein of Wollmeise Pure 100% Merino Superwash, at Knit Nation 2010 in London. The colour is called “Granatapfel” (pomegranate). 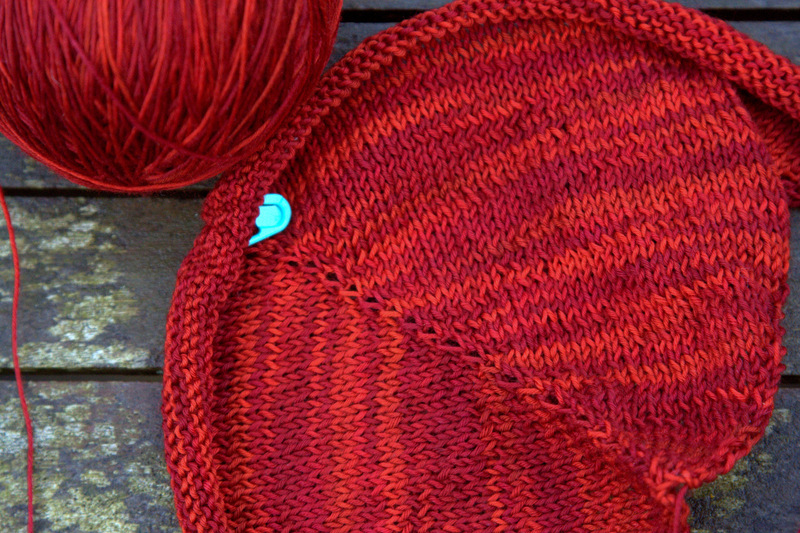 I bought it before I realized that I love variegated yarn much better in the skein than in the project. 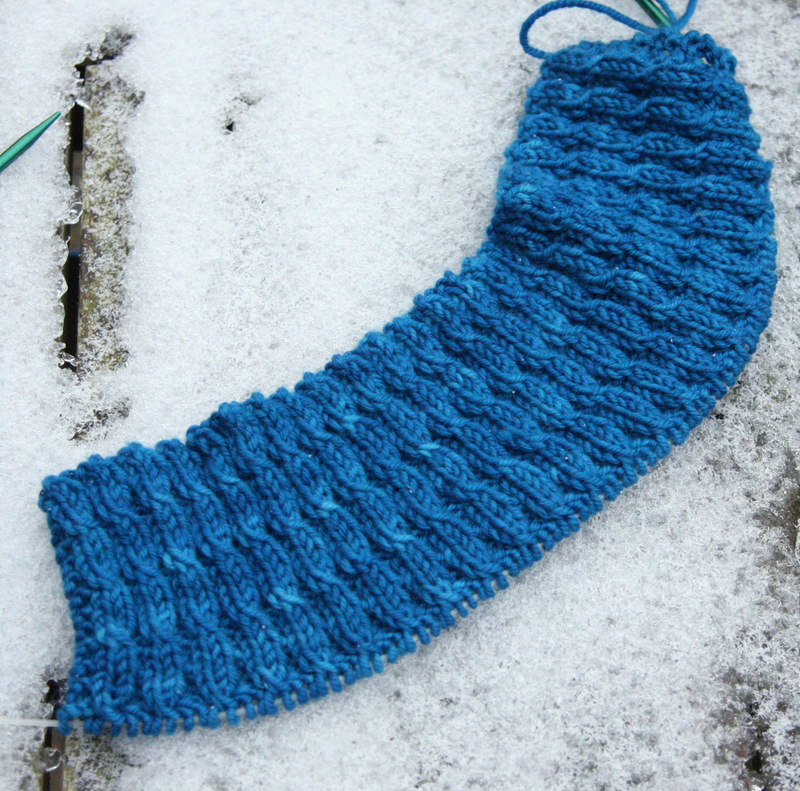 I have been knitting away on the shawl this week, but am still not sure if I like the way the colour looks. I think Haruni would be gorgeous in a very saturated pure shade. I am going to give it a try anyway and hope when it is blocked the colour will look more organic and not fractured. I have a feeling both the Exeter and the Haruni will be shoved aside this week, while Livvy takes the foreground. Luckily, I foresee a lot of knitting in my immediate future. The university will be closed for 5 days over Easter. During this same period, the train station in my city is being closed for repairs, and the weather is due to remain cold and snowy. This may be a recipe for misery for thousands of holiday-makers during Spring Break, but we knitters can find joy in being housebound. This entry was posted in Main and tagged Emily Ross, Exeter Jacket, Haruni shawl, Knitting, Livvy pullover, The Uncommon Thread, The Uncommon Thread Lush Worsted, Tori Gurbisz, Wollmeise, Wollmeise Pure 100% Merino Superwash by knitigatingcircumstances. Bookmark the permalink. I love that blue! 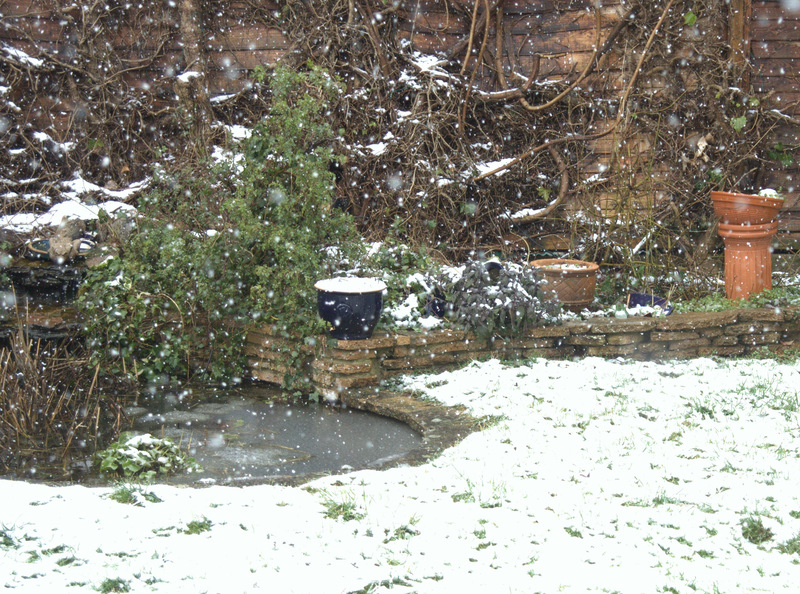 Enjoy your housebound time. Lovely work, delightful yarn as always. And so true: “… knitters can find joy in being housebound.” As knitters, we do often see the world through yarn-covered glasses, don’t we? That yarn is really beautiful.. I bought some sample ball of their yarn, they do really nice things. 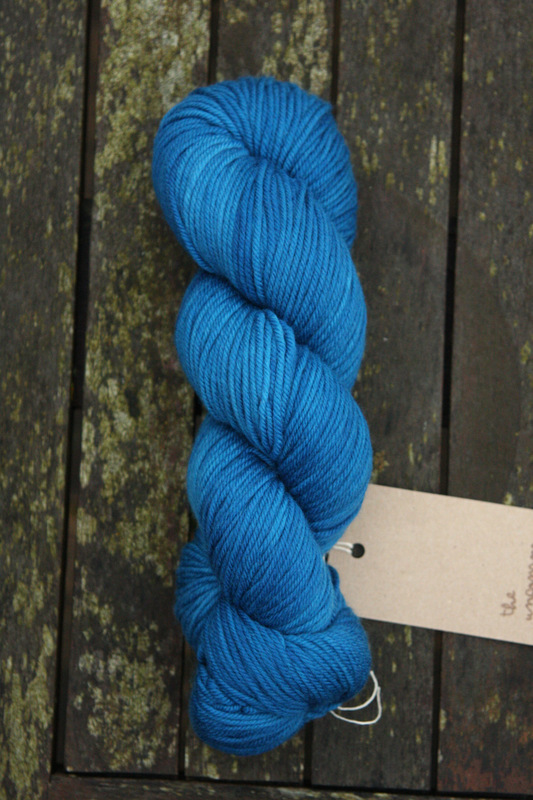 I was lucky to get it through an online shop who stocks plenty of local and indie producers / hand-dyers.